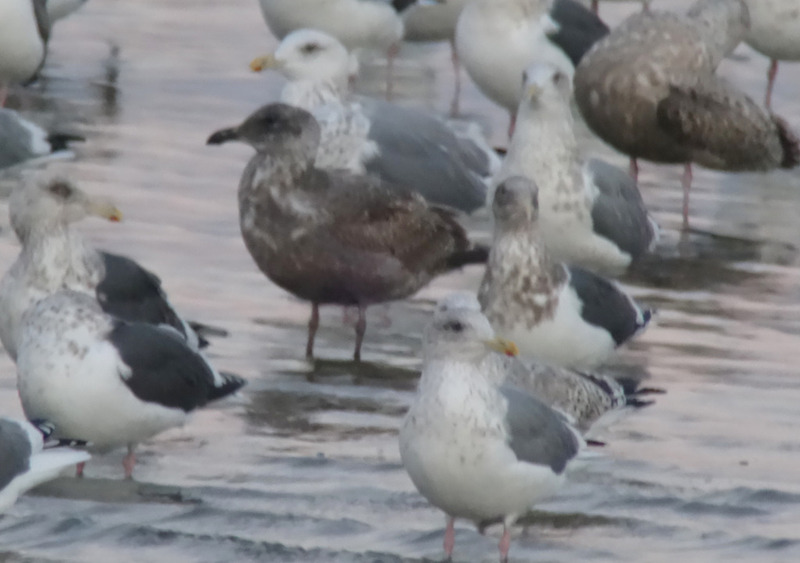 The Gangneung Western Gull: Pure Enough or “just” a Hybrid American Gull? Revisiting a potential first for Korea (and Asia?) in the hope of more comments! At dusk on December 6th 2014, I found a striking looking large gull in a river-mouth in Gangneung City on the northeast coast of the Republic by Korea (ROK). My immediate impression was that it looked closest to a First-winter Western Gull Larus occidentalis, a species previously unrecorded in Korea and perhaps even outside of North America. I therefore took a series of hurried digiscoped images through a superb Swarovski scope (20-30 in total, most in a two minute period as it preened, walked and then took flight, with the time-stamp helping to confirm that the standing and flying bird in the image sequences were the same); dictated some notes into my phone; and took some very short field notes, all the time mindful of the possibility / probability that this might instead be an exceptionally odd Slaty-backed Gull Larus schistisagus or a hybrid of some kind. I quickly tried to call others in our team, and the bird was seen briefly by both Subhojit Chakladar and Jason Loghry as darkness started to fall. That night, a quick review of images and my notes convinced me that it really did show many features of Western Gull (WEGU), a species I had seen a few times before in visits to California (many, but last in the 1990s) and BC (few, with many more hybrid-types, most recently in 2007). We revisited the river-mouth the next morning but could not find the bird again. We also shared the information with several other birders, in the hope that they could secure better images. Figure 2: Same gull at late dusk © Nial Moores. 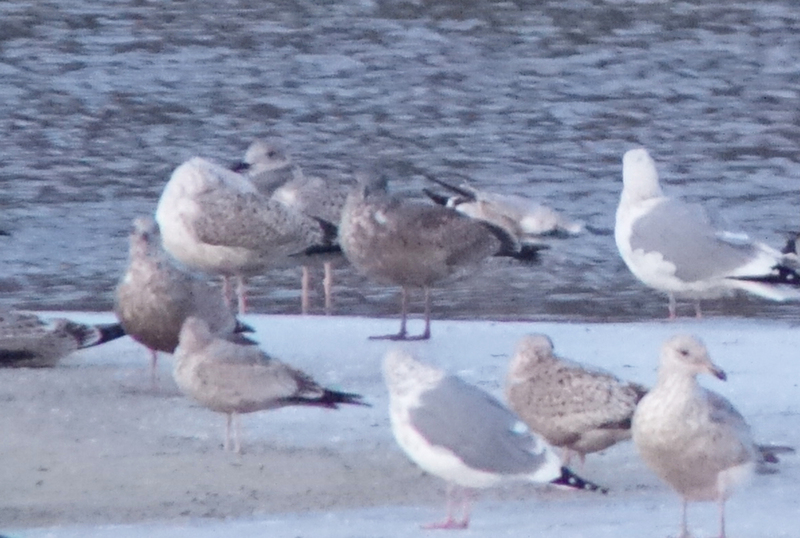 As noted in all field views, the gull (here in the centre, standing at the back of the ice) looked heavily-built and dark at rest, with grey-brown underparts, paleing on the vent and with strongly barred white-based undertail coverts. The tertials were blackish-brown with a broad white fringe (lacking notches), and the primaries were black with faint pale tips. The head looked very dark and grey-washed, and the upperparts lacked obvious pale fringes. NB: several other First-winter gulls looked similarly dark on the underparts in direct comparison (e.g. 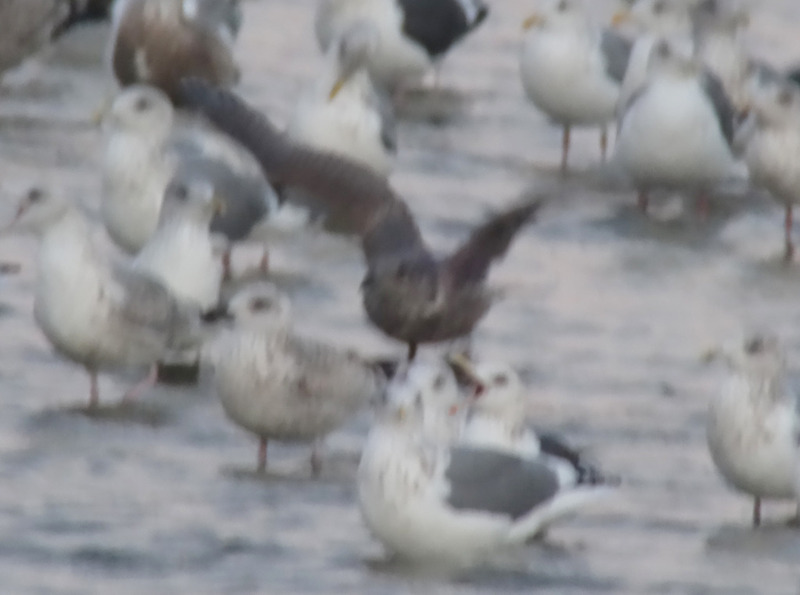 the bird to the left), and some of the suggested darkness was likely due to the conditions (long-range digiscope images at dusk of gulls in water and on ice). Still incredulous but hopeful it might be re-found, I mailed a few images and questions to Tristan McKee and Peter Pyle in California (as the three of us were then working together on a paper on Slaty-backed Gull identification). TM’s excited response was that it looked like a Western. He commented that the bill looked a little on the small side but within the expected range of a female; the underside of the primaries looked a little pale (raising the possibility of hybrid influence from Glaucous-winged Gull Larus glaucescens, a very frequent hybrid type); but finished by saying that “This bird would certainly be called a pure Western in California, with only that extremely blurred shot showing the undersides of the primaries [Figure 6 below] suggesting that they may be on the pale side (can’t really tell though)” (TM, in lit. December 9th 2014). PP’s initial response was also encouraging, though rather more cautious, identifying several features that looked very good for Western Gull (including the wing coverts at rest) and other features which might suggest some hybrid influence. These included most especially the pale appearance of the undersides of the primaries in one (or more) of the images, and the apparent lack of obvious fringing on the upperparts. Even a hybrid with some WEGU influence would be a great record this side of the Pacific (raising multiple questions!) , so I quickly wrote two online posts detailing the identification process (still both here), gradually adding extra images and commentary in order to help raise interest in this striking-looking bird. Together, we also tried to elicit the opinions of other gullers. There were only a few responses, however, and as the images were poor and some questions remained (including about the extent of photographic artefact), these responses were predictably a little mixed. Helpfully, though, the bird was considered by all who responded either to be a pure WEGU or a hybrid WEGU x Glaucous-winged Gull (GWGU). The main sticking point tended to be the appearance of the underwing. As shown in a series of images of underwings on the Slater Museum of Natural History website, the underwing is darkest in WEGU, paler in hybrids and palest in GWGU. 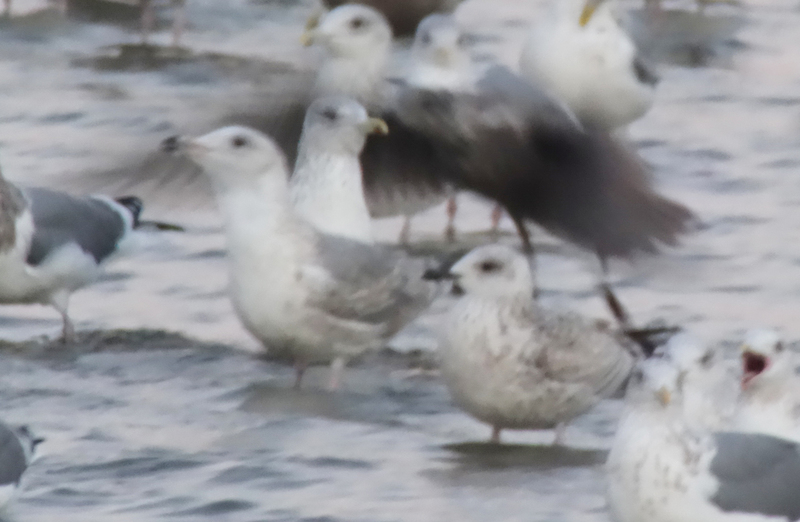 Interest in this “possible hybrid or Western-type Gull” within Korea seemed almost as cool as the weather, however. A few people did search for it, apparently, but sadly the bird was not refound. During the next week or two, looking more closely at additional images which had not yet been posted because they were so blurry, I gradually became convinced that this bird actually had quite dark underwings. Like the upperwing, the underwing seemed to match pure WEGU better than hybrid WEGU x GWGU. A couple of these additional images are shown below. Figure 3: The bird taking flight, showing some of the underwing. 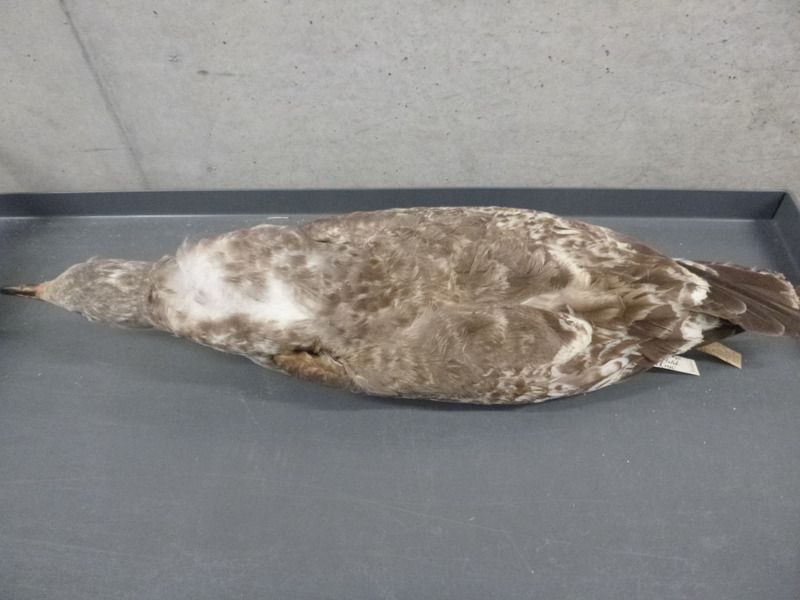 In this image, the underwing coverts (left wing) and the underside of the outer primaries (right wing) both look dark. The lack of pale here cannot be explained easily by a lack of contrast picked up the camera. The light was already flat and poor (so there was limited shadow effect), and contrast is still visible in the paler leading edge of the wing. Moreover, the pale blotches on the neck sides and breast (in the “shaded” part of the bird) are still easy to see. If the underwings had been as pale as expected in a hybrid WEGU x GWGU, then some of that paleness should have been visible in this image. 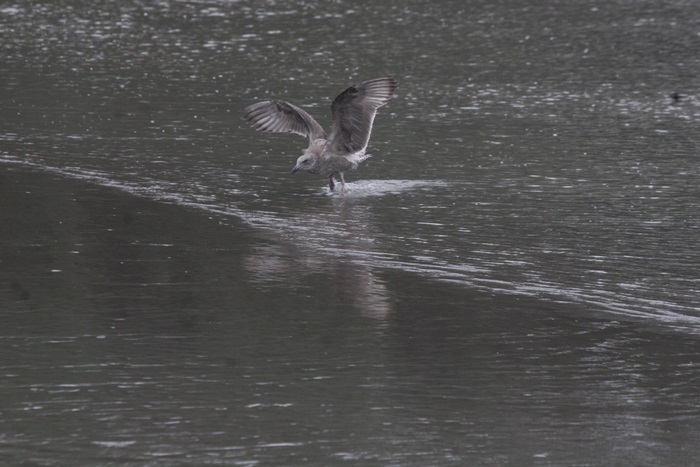 Figure 4: This next image confirms that the upperwings were darker than shown by any regularly-occurring Korean gull. Although blurred, the scapulars look dark grey; the upperwing coverts look dark brown; the secondaries look darker than the coverts and scapulars, with some pale evident; the outer primaries look dark (pale-tipped, some look black, others look grey – presumably partly photographic artefact as the bird clearly had black primaries at rest with narrow paler tips); and there is only a very faintly paler area across the inner primaries. The palest areas on the bird are again on the neck and/ or breast sides; perhaps in the rump and uppertail coverts (which according to my notes were constrastingly white when the bird was flying away); and as a weak pale line marking off the scapulars from the wing coverts. 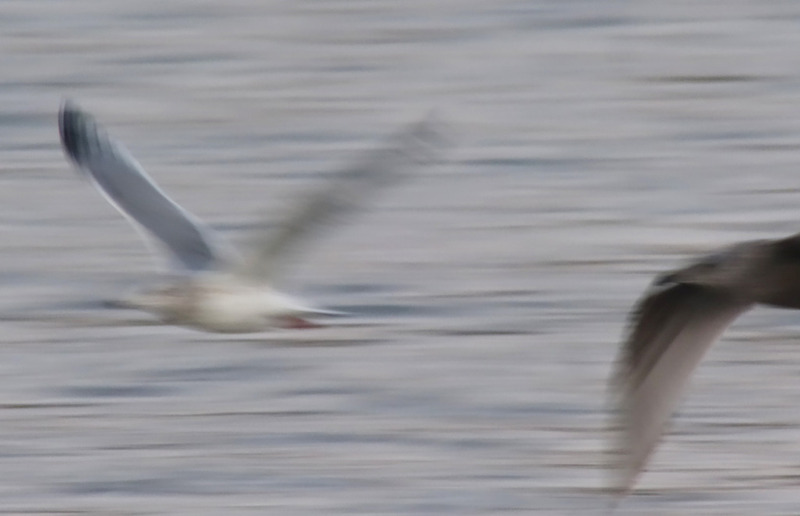 Figure 5: The next blurry image in the series as the bird took flight. The underside of the outer primaries and the tail still both look plainly dark, though perhaps with some pale on t6 (especially towards the base). The underwing coverts also still look extremely dark. The serrated look to the underside of the secondaries with some pale edge and the translucent blur blocking out the gull behind suggests that the bird had a quite broad white secondary trail. Again the pale on the breast or neck sides is clearly visible as is the dark eye, suggesting that the camera was catching much of the contrast. Figure 6. This was the original image that suggested that the underwing might be too pale for pure WEGU. 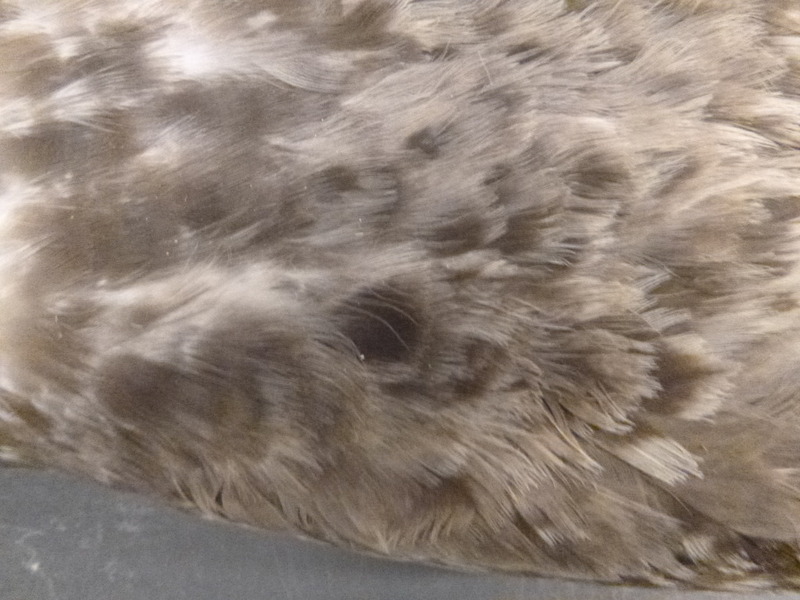 However, even with increased brightness and mildly reduced contrast, the underwing (lesser and median) coverts still look extremely dark; there are paler mud-brown bases to what appear to be the greater coverts that seem to form a pale and dark bar; and the underside of the primaries are clearly darker than the secondaries. Comparing the shade of the secondaries with the white parts of the Vega Gull behind (all clearly shown, and where “expected”) makes it apparent that the underwing really is dark. The palest parts of the wing look to be a vagely paler area at the base of the inner primaries, and especially a faintly white or whiteish line along the secondaries, which abruptly darkens into a black trail on the primaries. 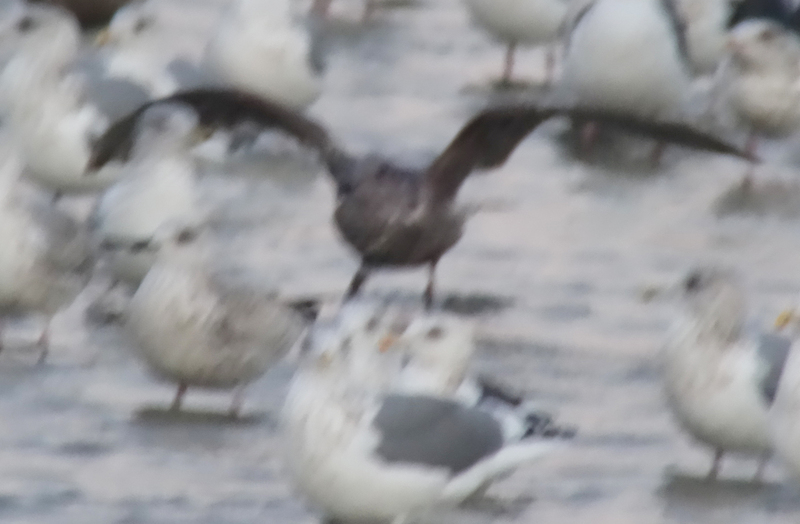 Although this blurry digiscoped image is of a flying bird taken at late dusk, the general pattern of contrasts evident in this image still seems to match well published images of the underwing of First-winter Western Gull. Also compare with Figure 7 (below) and images of hybrids linked to above. 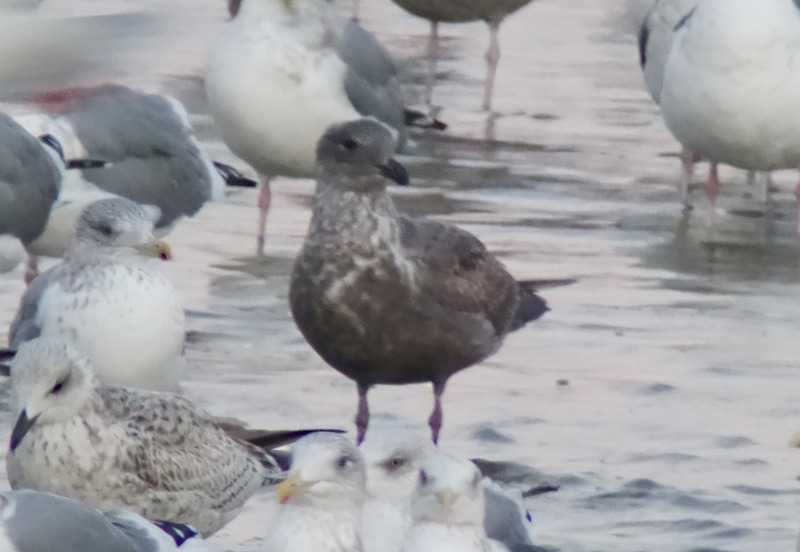 Figure 7: First-winter Western Gull, California (December 2014) © Peter Pyle. Reviewing a draft of this note, and looking at these images, PP wrote “From these views of the underwing your bird easily matches that of the WEGU, especially concerning the dark tone to the underwing coverts.” (PP in lit. July 7th 2015). If the underwing and upperwing can be considered to be within the range of WEGU, that still leaves the apparently odd lack of upperpart fringes as suggested by the images. This, combined with the poor light, makes the bird look very dark, even for a WEGU. In mid-December, PP visited the California Academy of Sciences to research this feature. Through examination of WEGU collected from August through March, he was able to confirm that some First-cycle WEGU lacked obvious pale upperpart fringing. At that time PP wrote: “I’m more convinced that your bird is a ‘good’ WEGU… some of the birds had formative feathers that lacked fringing, though most had fringing. Earlier-replaced feathers seemed to have weaker fringing that can wear off, which may be the best explanation for this in the Korea bird. I was unable to find a December bird that had as many back feathers replaced, but all in all I’m satisfied now that the fringing issue is not a problem.” (PP in lit. December 18th 2014). As the vast majority of (obviously) hybrid WEGU x GWGU show paler primaries in the closed wing at rest; and/ or pale underwings, and as this bird showed many “good” WEGU features, I gradually came to recognise that this bird was indeed a pure (or pure enough!) Western Gull. And while reviewing this draft, based on his much greater experience with and knowledge of this species and the appearance of hybrids, PP also concluded that “there is absolutely nothing else suggesting GWGU expression in the Korea bird” (Peter Pyle in lit. July 7th 2015). Based on these additional images (which have been cropped, sharpened, brightened and had contrast reduced by 10-20% but otherwise unaltered), supported by the recounting of the identification process as above, do others with experience of Pacific gulls still see evidence of “some minor GWGU influence” in this bird, evidence of features that would suggest the gull e.g. was 1/4 or more GWGU? If so, please let us know. 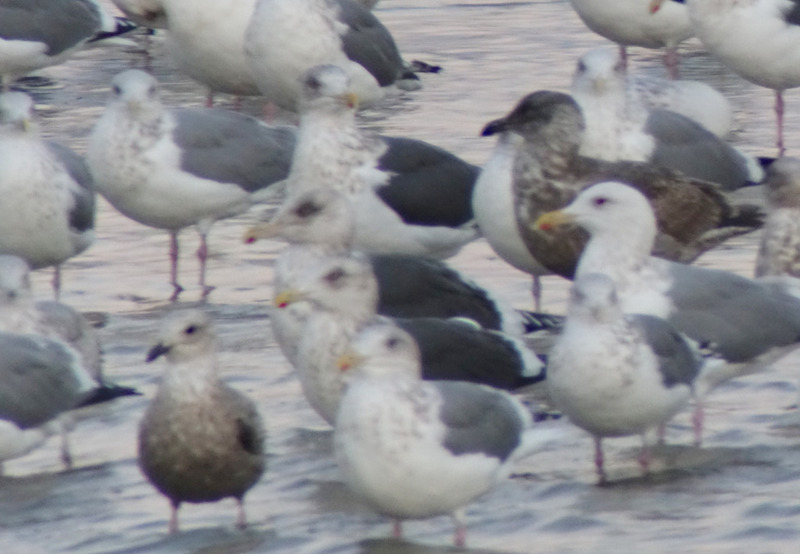 Or do you agree instead that it is best identified and listed more simply as a Western Gull, the first record for Korea? As we have no widely-accepted rarities committee, and as all identifications made for the Birds Korea Checklist are (always) open to expert independent input, your comments and opinions are genuinely warmly appreciated. Thank you in advance.